The Battle of Crécy established England as a military power. It is impossible to establish with any certainty the exact number of inhabitants in England at the eve of the Black Death, and estimates range from 3 to 7 million. The number is probably in the higher end, and an estimate of around 6 million inhabitants seems likely. Earlier demographic crises − in particular the Great Famine of 1315–1317 − had resulted in great numbers of deaths, but there is no evidence of any significant decrease in the population prior to 1348. England was still a predominantly rural and agrarian society; close to 90 percent of the population lived in the countryside. Of the major cities, London was in a class of its own, with perhaps as many as 70,000 inhabitants. Further down the scale were Norwich, with around 12,000 people, and York with around 10,000. The main export, and the source of the nation's wealth, was wool. Until the middle of the century the export had consisted primarily of raw wool to cloth makers in Flanders. Gradually though, the technology for cloth making used on the Continent was appropriated by English manufacturers, who started an export of cloths around mid-century that would boom over the following decades. Politically, the kingdom was evolving into a major European power, through the youthful and energetic kingship of Edward III. In 1346, the English had won a decisive battle over the Scots at the Battle of Neville's Cross, and it seemed that Edward III would realise his grandfather Edward I's ambition of bringing the Scots under the suzerainty of the English crown. The English were also experiencing military success on the continent. Less than two months before the Battle of Neville's Cross, a numerically inferior English army led by the king himself won a spectacular victory over the French royal forces at the Battle of Crécy. The victory was immediately followed by Edward laying siege to the port city of Calais. When the city fell the next year, this provided the English with a strategically important enclave that would remain in their possession for over two centuries. The term "Black Death" – which refers to the first and most serious outbreak of the Second Pandemic – was not used by contemporaries, who preferred such names as the "Great Pestilence" or the "Great Mortality". It was not until the 17th century that the term under which we know the outbreak today became common, probably derived from Scandinavian languages. It is generally agreed today that the disease in question was plague, caused by Yersinia pestis bacteria. These bacteria are carried by fleas, which can be transferred to humans through contact with rats. Flea bites carry the disease into the lymphatic system, through which it makes its way to the lymph nodes. Here the bacteria multiply and form swellings called buboes, from which the term bubonic plague is derived. After three or four days the bacteria enter the bloodstream, and infect organs such as the spleen and the lungs. The patient will then normally die after a few days. A different strain of the disease is pneumonic plague, where the bacteria become airborne and enter directly into the patient's lungs. This strain is far more virulent, as it spreads directly from person to person. These types of infection probably both played a significant part in the Black Death, while a third strain was more rare. This is the septicaemic plague, where the flea bite carries the bacteria directly into the blood stream, and death occurs very rapidly. A study reported in 2011 of skeletons exhumed from the Black Death cemetery in East Smithfield London found Yersinia pestis DNA. An archaeological dig in the vicinity of Thornton Abbey in Lincolnshire was reported in the science section of The Guardian for November 30, 2016, not only confirming evidence of the Y. pestis DNA in the human remains exhumed there but also dating the remains to mid-1349. The Black Death seems to have originated in Central Asia, where the Y. pestis bacterium is endemic in the rodent population. It is unknown exactly what caused the outbreak, but a series of natural occurrences likely brought humans into contact with the infected rodents. The epidemic reached Constantinople in the late spring of 1347, through Genoese merchants trading in the Black Sea. From here it reached Sicily in October that same year, and by early 1348 it had spread over the entire Italian mainland. It spread rapidly through France, and had reached as far north as Paris by June 1348. Moving simultaneously westward, it arrived in the English province of Gascony around the same time. According to the chronicle of the grey friars at King's Lynn, the plague arrived by ship from Gascony to Melcombe in Dorset – today normally referred to as Weymouth – shortly before the Feast of St. John The Baptist on 24 June 1348. Other sources mention different points of arrival, including Bristol and Southampton. Though the plague might have arrived independently at Bristol at a later point, the Grey Friars' Chronicle is considered the most authoritative account. If it is assumed that the chronicle reports the first outbreak of the plague, rather than its actual arrival, then the arrival most likely happened around 8 May. Another practice was the use of pigeons when treating swellings. Swellings which were white in appearance and deep were unlikely to break and were anointed with Oil of Lillies or Camomil. Once the swelling rose to a head and was red in appearance and not deep in the flesh, it was broken with the use of a feather from a young pigeon's tail. The feather's fundament was held to the swelling and would draw out the venom. However, if the swelling dropped and became black in appearance, the physician had to be cautious when drawing the cold from the swelling. If it was too late to prevent, the physician would take the young pigeon, cut it open from breast to back, break it open and apply the pigeon (while still alive) over the cold swelling. The cupping therapy was an alternative method which was heated and then placed over the swellings. Once the sore was broken, the physician would apply Mellilot Plaister with Linimentum Arcei and heal the sore with digence. The pioneering work in the field was made by Josiah William Russell in his 1948 British Medieval Population. Russell looked at inquisitions post mortem (IPMs) – taken by the crown to assess the wealth of the greatest landowners after their death – to assess the mortality caused by the Black Death, and from this arrived at an estimate of 23.6 percent of the entire population. He also looked at episcopal registers for the death toll among the clergy, where the result was between 30–40 percent. Russell believed the clergy was at particular risk of contagion, and eventually concluded with a low mortality level of only 20 percent. Several of Russell's assumptions have been challenged, and the tendency since has been to adjust the assessment upwards. Philip Ziegler, in 1969, estimated the death rate to be at around one third of the population. Jeremy Goldberg, in 1996, believed a number closer to 45 percent would be more realistic. A 2004 study by Ole Jørgen Benedictow suggests the exceptionally high mortality level of 62.5 percent. Assuming a population of 6 million, this estimate would correspond to 3,750,000 deaths. Such a high percentage would place England above the average that Benedictow estimates for Western Europe as a whole, of 60 percent. A death rate at such a high level has not been universally accepted in the historical community. In 2016, Carenza Lewis reported the results of a new method of assessing the death toll. She argued that pottery before and after the Black Death is datable because there was a change at that time from the high medieval to the late medieval style, and that counts of pottery of each type therefore provide a useful proxy for long term changes in population. She and her colleagues analysed pottery sherds from test pits in more than 50 continuously occupied rural settlements in eastern England, and found a decline in the number of pottery producing pits of 45 percent. Norfolk had the greatest drop of 65 percent, while there was no drop in 10 percent of settlements, mostly commercial centres. Archbishop Zouche of York issued a warning throughout the diocese in July 1348 (when the epidemic was raging further south) of 'great mortalities, pestilences and infections of the air'. The manorial records offer a good opportunity to study the geographical distribution of the plague. Its effect seems to have been about the same all over England, though a place like East Anglia, which had frequent contact with the Continent, was severely affected. On a local level, however, there were great variations. A study of the Bishop of Worcester's estates reveal that, while his manors of Hartlebury and Hambury had a mortality of only 19 percent, the manor of Aston lost as much as 80 percent of its population. The manor rolls are less useful for studying the demographic distribution of the mortality, since the rolls only record the heads of households, normally an adult male. Here the IPMs show us that the most vulnerable to the disease were infants and the elderly. There seem to have been very few victims of the Black Death at higher levels of society. The only member of the royal family who can be said with any certainty to have died from the Black Death was in France at the time of her infection. Edward III's daughter Joan was residing in Bordeaux on her way to marry Pedro of Castile in the summer of 1348. When the plague broke out in her household she was moved to a small village nearby, but she could not avoid infection, and died there on 2 September. It is possible that the popular religious author Richard Rolle, who died on 30 September 1349, was another victim of the Black Death. The English philosopher William of Ockham has been mentioned as a plague victim. This, however, is an impossibility. Ockham was living in Munich at the time of his death, on 10 April 1347, two years before the Black Death reached that city. Among the most immediate consequences of the Black Death in England was a shortage of farm labour, and a corresponding rise in wages. The medieval world-view was unable to interpret these changes in terms of socio-economic development, and it became common to blame degrading morals instead. The landowning classes saw the rise in wage levels as a sign of social upheaval and insubordination, and reacted with coercion. In 1349, King Edward III passed the Ordinance of Labourers, fixing wages at pre-plague levels. The ordinance was reinforced by Parliament's passing of the Statute of Labourers in 1351. The labour laws were enforced with ruthless determination over the following decades. 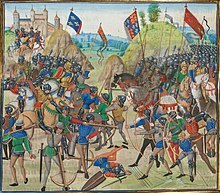 Peasants' Revolt: rebel leader Wat Tyler is killed on the left, while the young Richard II pacifies the crowd on the right. These legislative measures proved largely inefficient at regulating the market, but the government's repressive measures to enforce them caused public resentment. These conditions were contributing factors to the Peasants' Revolt in 1381. The revolt started in Kent and Essex in late May, and once the rebels reached London they burnt down John of Gaunt's Savoy Palace, and killed both the Chancellor and the Treasurer. They then demanded the complete abolition of serfdom, and were not pacified until the young King Richard II personally intervened. The rebellion was eventually suppressed, but the social changes it promoted were already irreversible. By around 1400 serfdom was virtually extinct in England, replaced by the form of tenure called copyhold. It is conspicuous how well the English government handled the crisis of the mid-fourteenth century, without descending into chaos and total collapse in the manner of the Valois government of France. To a large extent this was the accomplishment of administrators such as Treasurer William de Shareshull and Chief Justice William Edington, whose highly competent leadership guided the governance of the nation through the crisis. The plague's greatest effect on the government was probably in the field of war, where no major campaigns were launched in France until 1355. Another notable consequence of the Black Death was the raising of the real wage of England (due to the shortage of labour as a result of the reduction in population), a trait shared across Western Europe, which in general led to a real wage in 1450 that was unmatched in most countries until the 19th or 20th century. The higher wages for workers combined with sinking prices on grain products led to a problematic economic situation for the gentry. As a result, they started to show an increased interest for offices like justice of the peace, sheriff and member of parliament. The gentry took advantage of their new positions and a more systematic corruption than before spread. A result of this was that the gentry as a group became highly disliked by commoners. The omnipresence of death also inspired greater piety in the upper classes, which can be seen in the fact that three Cambridge colleges were founded during or shortly after the Black Death. England did not experience the same trend of roving bands of flagellants, common on the continent. Neither were there any pogroms against the Jews, since the Jews had been expelled by Edward I in 1290. In the long run, however, the increase in public participation may have served to challenge the absolute authority of the church hierarchy, and thus possibly helped pave the way for the Protestant Reformation. The high rate of mortality among the clergy naturally led to a shortage of priests in many parts of the country. The clergy were seen to have an elevated status among ordinary people and this was partly due to their closeness with God, being his envoys on earth. However, as the church itself had given the cause of the Black Death to be the impropriety of the behaviour of men, the higher death rate among the clergy led the people to lose faith in the Church as an institution − it had proved as ineffectual against the horror of Y. pestis as every other medieval institution. The corruption within the Catholic priesthood also angered the English people. Many priests abandoned the terrified people. Others sought benefits from the rich families who needed burials. The dissatisfaction led to anti-clericalism and the rise of John Wycliffe, an English priest. His ideas paved a path for the Christian reformation in England. Some people didn't lose their Christian faith, if anything it was renewed; they began to long for a more personal relationship with God − around the time after the Black Death many chantries (private chapels) began to spread in use from not just the nobility, but to among the well to do. This change in the power of the papacy in England is demonstrated by the statutes of Praemunire. The Black Death also affected arts and culture significantly. It was inevitable that a catastrophe of such proportions would affect some of the greater building projects, as the amount of available labour fell sharply. The building of the cathedrals of Ely and Exeter was temporarily halted in the years immediately following the first outbreak of the plague. The shortage of labour also helped advance the transition from the Decorated style of building to the less elaborate Perpendicular style. The Black Death may also have promoted the use of vernacular English, as the number of teachers proficient in French dwindled, contributing to the late 14th century flowering of English literature, represented by writers such as Geoffrey Chaucer and John Gower. 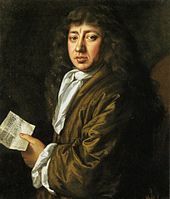 In his diaries, Samuel Pepys gave a vivid description of the Great Plague of London; one of the last outbreaks of the Second Pandemic. The Black Death was the first occurrence of the Second Pandemic, which continued to strike England and the rest of Europe more or less regularly until the 18th century. The first serious recurrence in England came in the years 1361−62. Little is known about the death rates caused by these later outbreaks, but the so-called pestis secunda may have had a mortality of around 20 percent. This epidemic was also particularly devastating for the population's ability to recover, since it disproportionately affected infants and young men. This was also the case with the next occurrence, in 1369, where the death rate was around 10−15 percent. Over the following decades the plague would return – on a national or a regional level – at intervals of five to 12 years, with gradually dwindling death tolls. Then, in the decades from 1430 to 1480, the disease returned in force. An outbreak in 1471 took as much as 10–15 percent of the population, while the death rate of the plague of 1479–80 could have been as high as 20 percent. From that point outbreaks became fewer and more manageable, due largely to conscious efforts by central and local governments – from the late 15th century onward – to curtail the disease. By the 17th century the Second Pandemic was over. One of its last occurrences in England was the famous Great Plague of London in 1665–66. ^ Cipolla, Carlo M. (1993). Before the Industrial Revolution: European Society and Economy 1000–1700 (3rd ed.). London: Routledge. pp. 260–1. ISBN 0-415-09005-9. ^ "death, n.". Oxford Dictionary of English. Retrieved 2009-01-06. (Subscription required (help)). ^ Goldberg, Jeremy (1996). "Introduction". In Mark Ormrod & P.G. Lindley. The Black Death in England. Stamford: Paul Watkins. p. 4. ISBN 1-871615-56-9. ^ Horrox, Rosemary (2006). "The Black Death, 1346–1353: The Complete History (review)". English Historical Review. cxxi: 197–9. doi:10.1093/ehr/cej012. ^ "Impact of the Black Death: 1349." ^ Harriss, Gerald (2005). 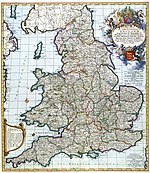 Shaping the Nation: England, 1360–1461. Oxford: Oxford University Press. pp. 447–8. ISBN 0-19-822816-3. ^ Kelly, John (3 January 2006). The Great Mortality; An Intimate History of the Black Death. Harper Perennial. p. 384. ISBN 0-00-715070-9. Goldberg, Jeremy (1996). "Introduction". In Mark Ormrod & P.G. Lindley. The Black Death in England. Stamford: Paul Watkins. pp. 1–15. ISBN 1-871615-56-9. Hilton, Rodney; Dyer, Christopher (2003). Bond Men Made Free: Medieval Peasant Movements and the English Rising of 1381 (2nd ed.). London: Routledge. ISBN 0-415-31614-6. Lewis, Carenza (June 2016). "Disaster recovery: new archaeological evidence for the long-term impact of the 'calamitous' fourteenth century". Antiquity. 90 (351). Ziegler, Philip (2003). The Black Death (News ed.). Sutton: Sutton Publishing Ltd. ISBN 0-7509-3202-3.